Fire prevention and control is key to minimizing risk at the bulk propane storage plant. This article, which first appeared in the Nov/Dec 2012 edition of Propane Canada magazine discusses the various aspects of fire control and prevention that should be considered. A client recently asked me, as part of their internal due diligence, to verify that appropriate fire prevention and fire controls were in place and operational at one of their propane bulk plants. The audit looked at the physical aspects of fire prevention and control as well as related policies and procedures. The following discusses the items that were addressed in the audit. Site security is the main factor in preventing unauthorized persons from entering the actual propane bulk tank storage yard. Unauthorized persons may unwittingly provide a source of ignition by either smoking or in the type of clothing they wear. Nylon outer clothing, shirts, jacket or pants can build up static electricity which can arc with sufficient energy to ignite propane vapours. The yard must have a controlled entry point. Gates are used to provide the controlled entry point and fencing around the perimeter of the yard provides the security. Signage at the entrance to the fenced yard warns unauthorized persons not to enter. Gates to the propane bulk tank storage yard must be closed and locked when the plant is not in use. 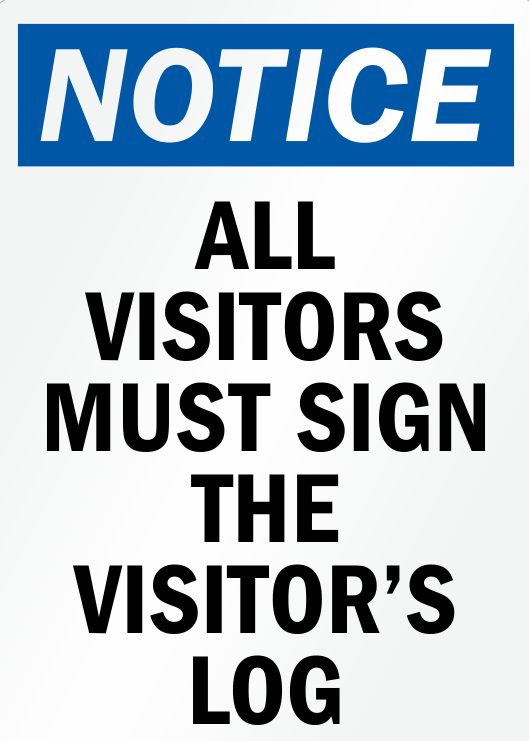 A visitors log is a good way to record who and when a non-employee enters the yards. Do not let visitors enter the yard unless escorted by an employee at all times. The escorting of non-employees ensures that the visitor does not inadvertently wander into yard traffic areas or propane transfer areas without the benefits of the proper clothing and that the visitor can be led to the evacuation meeting place should an emergency occur. These rules should apply to the general public as well as municipal, provincial or federal employees attending the facility as part of their work. It is also important to control the vehicles entering the fenced yard. Only allow essential vehicles to enter the fenced yard. Do not permit customer vehicles or employee vehicles to enter or park in the yard area. Provide parking spaces for customers and employees outside the fenced yard. Bulk trucks and cargo liners which are stationed out of the facility must, when parked, be within the fenced yard area. 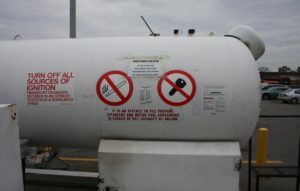 To prevent the release of propane from a damaged propane container or piping system, propane bulk storage tanks, as well as transient tanks and cylinders, must be protected from physical damage by either their location or barriers such as concrete filled posts, steel guard rails, and post or New Jersey concrete turnpike barriers. No smoking signs, turn off ignition signs, and UN1075 placards, as well as the company name and logo, stenciled on the propane bulk storage tanks, bulk trucks and cargo liners can act as a constant warning as to the product stored and transferred at the plant. A key component of fire prevention is training. Trained and certified personnel must only be allowed to drive bulk trucks/cargo liners, load and unload and to operate the facility. Ensure that employees have the correct training and level of certification before allowing them to perform any functions within the plant. It is essential that persons working within the propane bulk storage yard wear the appropriate clothing. Clothing can be cotton or blends of material as long as it does not build up a static electric charge. Ensuring that distances listed in the Code are initially provided and maintained from tanks and points of transfer, property lines and buildings. Ensuring the area around and under the bulk storage tanks gravel or asphalt are free of vegetation or material storage. Having all electrical components rated explosion proof Class 1, Group D.
Using hose end valves at unloading and loading bulkheads which are designed for limited liquid propane release on disconnect. Equipping Liquid and vapour openings in all tanks with Internal Safety Control Valves (ISC) that are closed when the plant is not in operation. Unloading of cargo liners and loading of bulk trucks is through bulkheads equipped with Emergency Shut-off Valves and back check valves. Having a grounding system in place at all unloading and loading bulkheads to prevent the buildup of static electricity. Using CSA certified hose assemblies used to transfer propane in and out of the plant which are inspected and tested annually in accordance with the requirements of Transport Canada Regulations and CAN/CSA B620 Highway Tanks and Portable Tanks for the Transportation of Dangerous Goods Standard. Permitting only cargo liner tanks and bulk truck tanks which are built, inspected and tested in accordance with the requirements of Transport Canada Regulations and CAN/CSA B620 Highway Tanks and Portable Tanks for the Transportation of Dangerous Goods Standard. Fire control relies on the physical plant design, components, and internal and external resources. The following is a list of items that one would expect to be in place to control a fire within a propane plant. Nitrogen or air activated valves with emergency shutdown stations located around the plant. As a minimum, shut down stations would be at each loading and unloading bulkhead and a safe area outside of the fenced yard. Air actuated Internal Safety Control Valves (ISC) and Emergency Shut-off Valves (ESV) which close on loss of nitrogen or air pressure. Nitrogen or air pressure is supplied by plastic tubing that melts if exposed to temperatures generated by fire or radiant heat causing a loss of air pressure within the system resulting in the automatic closure of all ISC and ESV valves. Hand-held fire extinguishers must be placed strategically around the facility to help control possible fire situations. Fire extinguishers must also be inspected and tagged annually by a company that specializes in maintaining fire extinguishers. Part of the monthly plant inspection must provide for fire extinguisher inspection to ensure the fire extinguisher is actually in place and properly charged. Since the local fire department (which may be a volunteer force) responds to calls at the facility, it is important to meet with the fire services and obtain a listing of the equipment that can be used to respond to a fire at your facility. This is also an opportune time to have the fire services visit the site. Sufficient space maintained in the yard to maneuver fire trucks for position to fight fires. Provincial or local fire services may also request additional fire suppression systems to be installed with a dedicated water supply to cool tanks and provide protection for emergency response personnel. It is a prudent exercise to look at the fire prevention and fire control systems and processes at your propane bulk storage plant on an annual basis to ensure that the correct policies and procedures are in place, all components are maintained and operate as required and that employees know what to do in the case of an incident.